Orvieto, Italy occupies a unique location atop a tufa plateau, technically a volcanic butte, in the region of Umbria, Italy. 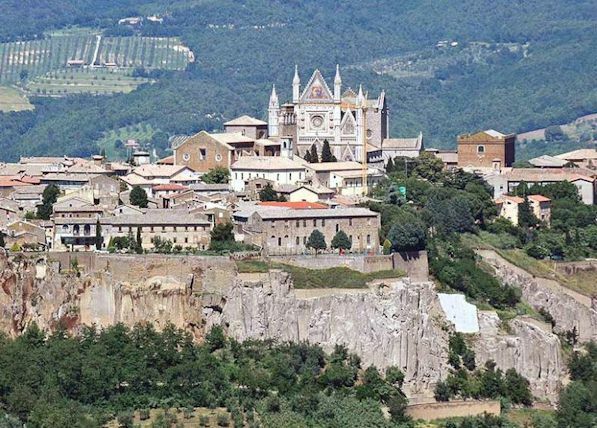 Any visitor to this part of Italy should on no account miss the opportunity to visit Orvieto. The plateau has been a centre of human creativity since at least Etruscan times but its crowning glory is its Duomo or Cathedral, and in particular the Gothic façade which is one of the great masterpieces of the Late Middle Ages. The three-gable design is attributed to Maitani, who was clearly influenced by the design of the façade in Tuscan Gothic style of Giovanni Pisano's Sienna Cathedral and the design of the façade of the Florence Cathedral by Arnolfo di Cambio. The duomo is composed of a nave with six bays and two aisles, and is cruciform in shape. While uncluttered and spacious in its first impression, the interior is as interesting as the exterior, decorated with, among many other great works of art, very fine gothic frescoes.